In the past it has been necessary to remove all minerals and metal containers for drinking water in order to achieve a full therapeutic effect from the Doxycyline because they have a negating effect on the proper absorption of the tetracycline family of drugs, including Doxycycline. Doxycycline is added to Megamix to aid the absorption of Calcium and Magnesium salts during treatment. This allows breeding to continue during treatment without retarding the growth of chicks or weakening the breeding hen during egg-laying. 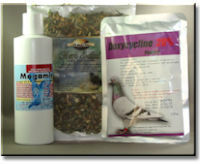 Doxycycline/Megamix Coctail is used to treat Chlamydia/ Psittacosis during the molt where its use accelerates rather than depresses new feather growth. Minerals my now be fed when Megamix is added to the drinking water during a Doxycycline treatment. Megamix is ideally suited for this purpose and has a dual action. Firstly, recovery is accelerated because there is no need to restrict mineral supplements that are vital for a full recovery from Ornithosis/Chlamydia. Secondly, Megamix contains a special wetting agent that keep water containers free of bacteria and microorganisms that inhibit recovery during antibiotic use. Doxycycline 20% mixing rate is ¼ teaspoon per liter of water. Mixture must be mixed fresh each day. Ornithosis/Chlamydia infections in Finches treat for 30 days. Psittacosis/Chlamydia infections in Parrots treat for 45 days. Other bacterial infections treat birds for 7 to 10 days. Remove medicated water right before lights off at night. Replace fresh mixed medicated water first thing in the am. Mixture must be mixed fresh each day. Remove all other water sources including greens, fruits & vegetables on treatment days. Keep medication water out of direct sunlight. Place drinkers in shade if outdoors. Megamix use 3ml per liter of water. Some aviary situations may require more or less Megamix depending upon your humidity factor and the acidity/alkalinity of the drinking water as it comes from the tap. If you have been using Megamix in your drinking water, use the same amount of the Doxycycline/Megamix cocktail per liter of water. Please email joanne@ladygouldianfinch.com if further explanation is necessary.